Over the weekend Web-princess had a retreat to go to as part of the confirmation prep. The retreat was at our church and was just for a few hours. Throughout the retreat there was opportunities for the candidates, my daughter and the other 13-14 year olds, to express love, admiration, and respect towards their parents or sponsors. The candidates were told to turn to their parents or sponsors, after the parents/sponsors express two things they loved and two things they liked about the candidate, and express two things they love about their parent/sponsor or two things they respect about them or one of each. My daughter sat there. She was struggling. She just ended up saying I admire you and I respect you. I was okay with that. I didn't press her. I could see she was thinking hard, but just couldn't come up with anything. Its hard sometimes to come up with things on the spot. Later, the candidates were instructed to take their parent or sponsor by the hand and introduce them to someone they really did not know and express to those people one thing they admire or respect about their parent or sponsor. This made my girl uneasy. This is because first she really couldn't come up with anything before and she simply does not like talking to strangers. She's cool if people approach her, but she simply does not want to approach someone else. Knowing this about my daughter I didn't push her. We just went to the refreshment table got drinks and I then asked her if she could at least express something she admire or respected about me. Just trying to see, seeing time had pass, if she had something specific to share. She had her worry face. The face I see often when she's afraid she has done something wrong. The face she has when she has regret. I gently and lovingly looked at her and asked what's wrong. Her reply, near tears, "I don't think I admire you." immediately followed by "I do love you and respect you." With that I just gave her a huge hug and said, "that's okay." Sure, my mom pride and heart was crush a bit on the spot, but since the moment has passed I'm extremely thankful that my daughter was honest and was comfortable with being honest with me. She might not be able to express it or realize it now, but as she ages I'm hopeful she will say, when she's older, I admire that I can be honest with my mom .... even if it might hurt her some. Even though those words stung some I'm glad to have heard them. It's made me realize that perhaps there are things I need to change. 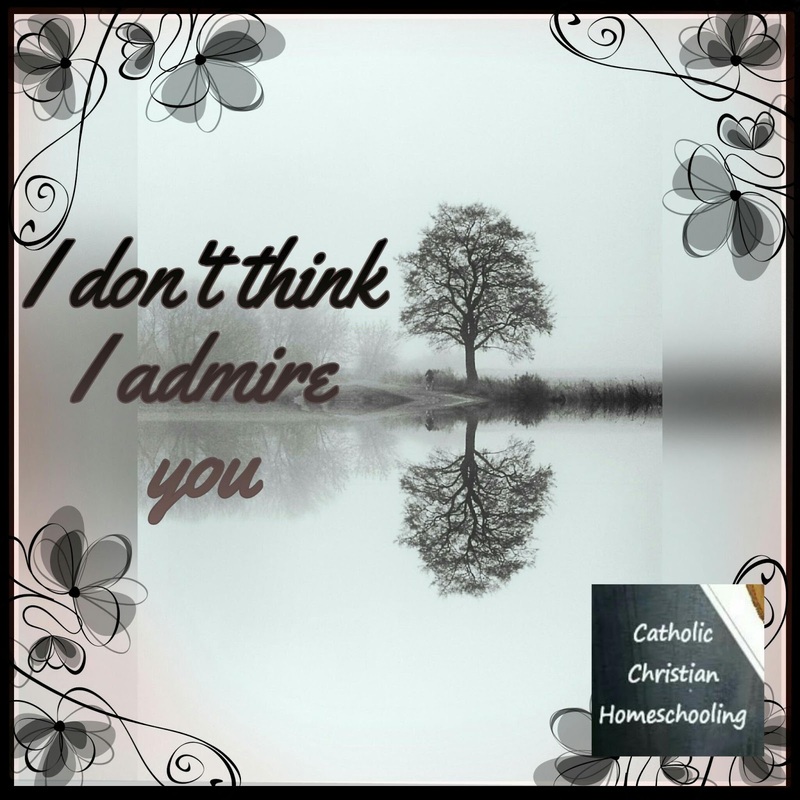 What would you think if your teen told you, with sincerity, not out of anger, they don't admire you? What would you feel you need to do different? What would you feel?